When bands are around as long as Bullet For My Valentine, they tend to get an idea pretty quickly of what they can nail musically and what they'd like to try to challenge themselves and their fans. 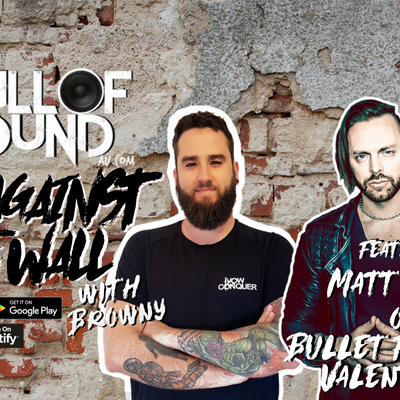 That seems to be the case with their brand new album Gravity which frontman Matt Tuck explains in this week's episode of Wall of Sound: Up Against The Wall. After scoring a #1 album in Australia with their last (heavy) release Venom, Matt is more than happy to explain why he's broadening the band's horizons with a more mainstream approach this time around with the band's sound and lyrical content... and he doesn't care who disagrees with him or gets in his way in the process. If you've doubted why bands/musicians changed their style over the years, this is one chat that should hopefully clear things up and explain why, more now than ever, the acts you love are trying new things that they hope will make you open your mind a bit more.